On Tuesday evening, the research and innovation community came to the MaRS Centre to celebrate the 2008 Premier’s Innovation Awards — three prestigious awards programs that support and promote ideas and discoveries that build on Ontario’s innovation strengths. 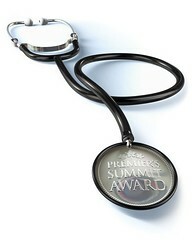 The Premier’s Innovation Awards include the Premier’s Catalyst, Discovery and Summit Awards. The Premier’s Summit Award program is administered by MaRS on behalf of the Province. Premier Dalton McGuinty and Minister of Research and Innovation John Wilkinson joined MaRS Board Chair John Evans and our CEO, Ilse Treurnicht to celebrate some of the best and brightest minds in Ontario’s research and innovation community. Dr. Frances Shepherd, Senior Staff Physician and Group Leader for the Lung Cancer site at Princess Margaret Hospital, University Heath Network. The Premier’s Summit Award recognizes researchers that have made a substantial and distinguished contribution to medical research in Ontario, and show promise to do even more. It’s a $25 million program that provides extraordinary support to a small number of outstanding medical researchers, helping attract them to or retain them in Ontario and enabling them to significantly expand their research programs. Each recipient receives $5 million over a five-year period, derived from a $2.5 million contribution from the Award program matched by $2.5 million from the sponsoring institution. The selections are made by an internationally distinguished panel from the U.S., U.K. and Canada. The research focus of the six Award recipients spans from lung cancer research, to genomics, to Alzheimer’s disease. They are all poised to do more groundbreaking work and their contributions have the potential to improve human health worldwide. MaRS will be holding a panel discussion with past and present Summit Award winners about the impact of medical discoveries on health outcomes at “Science at the Summit” on May 27, 2008 between noon-2pm. The discussion will be moderated by Dr. David Naylor, President, University of Toronto.